College ain’t cheap! Sure there’s scholarships, but some schools practically ask for half your leg before you can even be considered for one… and even then, how much of your expense does it really cover? Did you know you can get scholarship money simply by taking the ACT, SAT, or both, and by having a GPA? 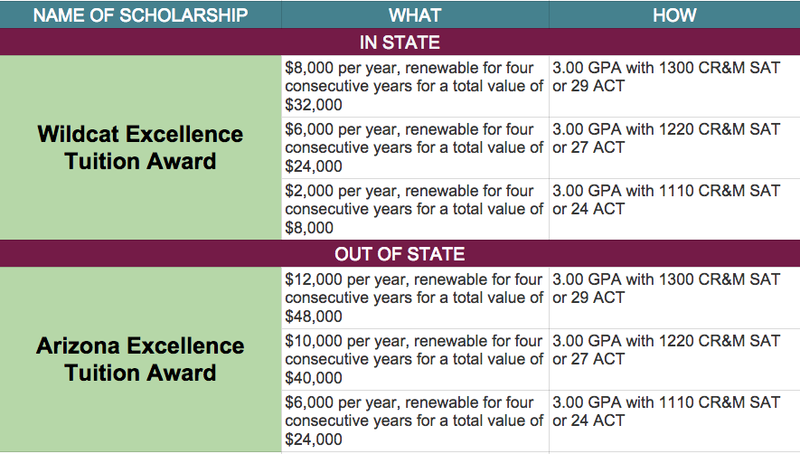 Merit Based Scholarships are scholarships that award you based on your academic efforts in High School — and you don’t have to be a genius to get them. Merit Based Scholarships are also automatically awarded to students after they are accepted. Here are Student-Tutor‘s Top Merit Based Scholarships and Scholarship schools. 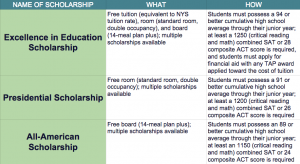 Let’s talk about FREE EVERYTHING — meaning full-ride scholarships. As long as your credits add up to 30 for the year you will receive a community style room, a 15-meal plan, full tuition and general fees at SE Missouri State for FREE when you achieve a 33 ACT or 1440 SAT score (SAT Critical Reading & Math section), coupled with a 3.9 GPA. I’ll admit, this one’s a little tougher criteria to start. If you’re a regular smarty-pants, it’s in the bag. If not, how about a 1210 score on the SAT and a 3.6 GPA? If you’re sitting at a steady 3.5, all it takes is a little nudge to your GPA and you can get free tuition! 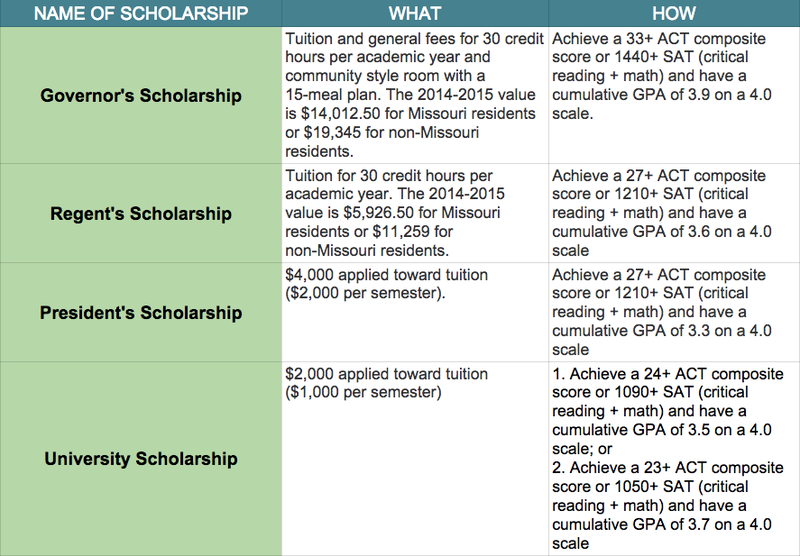 See this chart of all Merit Based (Academic) Scholarships for SE Missouri State. What if you do better on the ACT than the SAT? University of Arkansas wants your scores! The Merit Based (Institutional) Scholarships at University of Arkansas don’t even require SAT scores. If you can get a high score of at least 27 on your ACT, (19 of it being on the English and Math sections), and you have a 3.0, not only will they pay your tuition AND fees, but also your residential stipend, and Out-of-State tuition is waived. More full-ride scholarships? Uh, yes please. A 1250 on your Critical Reading and Math SAT scores 0R a 28 on the ACT. We can’t lie, this one calls for a 4.0. BUT a B average of 3.0 with an 1150 SAT or 24 ACT score will qualify you for free board with a 14-meal plan. Alfred State College offers Merit Based Scholarships as part of the Alfred State Distinguished Scholars Program. A 3.0 GPA with a 1330 SAT score would earn you 45% of tuition at UAH. With a 3.5, the same SAT score covers your tuition under the Charger Distinction Scholarship. With full tuition covered, it’s about 68% of full expenses. Let’s give another shout out to all those students sitting at a 3.5 GPA. What’s so wrong with having a few B’s anyway? But suddenly it makes all the difference for these big, competitive scholarships. At Troy University, if you’ve got a 3.5 and can land a score of 1260 on your SAT, they’ll pay your tuition with the Troy University Chancellor’s Award. Sure it’s not the full cost to attend — at least, not for your Freshman year. But it is 60% of those expenses! University of Alabama’s highest, guaranteed Merit Scholarship can cover MORE THAN HALF of your total expenses starting with your Freshman year. A 3.5 GPA will get you on the right track towards up to $99,800 towards school. (To get $1,500 from ASU, we said that your minimum SAT score would be 1200.) Just 10 points more than that will make you a Capstone Scholar and grant you $14,000 at University of Alabama! The state of Alabama keeps the love coming for students with a chance to earn up to half of it’s total yearly expenses. What do you need? A 3.5 GPA will give you access to the top 4 of 5 scholarships offered at University of Alabama at Birmingham. Got a low GPA? If it’s a 2.6 and you think you aren’t eligible for any scholarship, think again! According to The Princeton Review, the 1500 is the national average score for the SAT. You don’t even have to get that. With a GPA of 2.6 and a BELOW AVERAGE score of 1200 on the SAT, you just earned yourself a $1,500 yearly In-State scholarship! And what happens if you increase that score? At Student-Tutor, our students have experienced an average SAT score increase of 265 points after tutoring. At ASU, that’s an automatic $4,500 more. 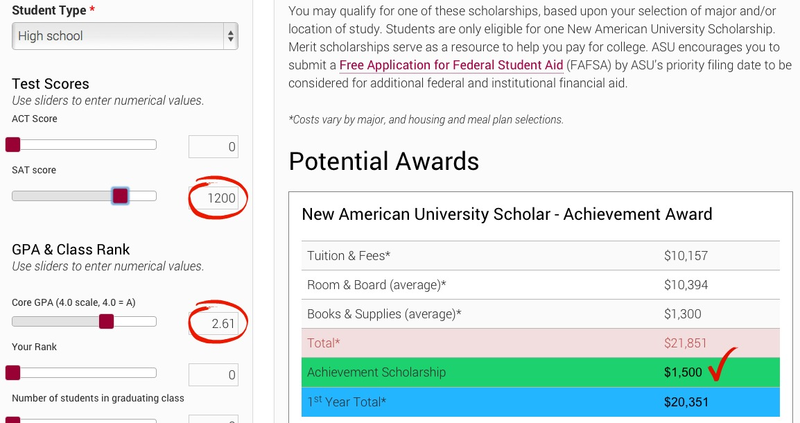 The ASU Scholarship Estimator is the perfect tool to show you exactly where you’re at, and what steps to take to get the scholarship you want. The highest academic scholarship ASU offers is the Presidential Scholarship, which will earn you a lovely $9,500 annual for In-State. What’s the formula for getting Oklahoma state scholarships? Start with a 3.00! A 1090 SAT or 24 ACT score will snag you up to $7,000 per year… that’s up to $28,000 total. Out-of-State students can receive up to $48,000 total from the UofA Arizona Excellence Tuition Award! That’s about 40% of all expenses for your Freshmen year at UofA. I probably need a 4.0 for this one, right? Nope! A 3.00 will work just fine. With a score of 1300 from your Critical Reading and Math sections or a 29 on your ACT, you’ve got it. With the same GPA of 3.00, scores as low as a 1110 or a 24 will still get you $24,000. Like I said before, just because a school offers a scholarship that sounds good, when you compare it to the actual cost of attending, it’s not so impressive. You don’t have to be a baby Einstein to get a scholarship there. If you put in some elbow grease to raise your numbers before applying, you have a chance to make a real dent in your college tuition. 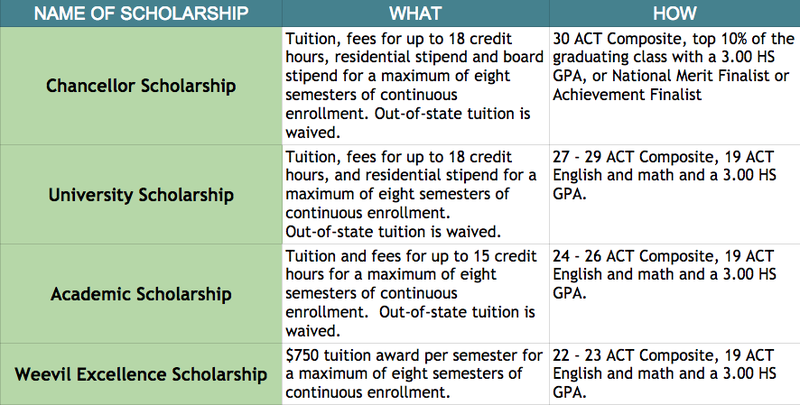 If you live in the state of the college offering your scholarship you are likely eligible for even more money than we talked about in this post! Also, if you did well on your PSAT, be sure to explore scholarship options for high PSAT scores. Know of any other great Merit-Based Scholarships offered by colleges in the US? Tell us in the comments below. I have got 1350 in SAT and 7 in IELTS but my high school GPA is only 2.5 and I am an international student…can I get scholarships? Hello Amod! This depends on many factors. I will send you an email! I’ve got a 1350 in the new sat and a 98 in TOEFL, what scholarships am I eligible for? It depends on what schools are applying to. Every school is different. You also need to take your unweighted GPA into account. Iam Eth iopian, I have SAT score of 1250 in critical reading and maths. At the time wants to join free tuition and accomedation scholarship in Medcine or computer engineering or( Electrical and computer Engineering). Please I need help. Hello, Leul! Unfortunately, my knowledge with international students getting full tuition scholarships is limited. It is something I do want to look into in the future though! Best of luck to you! Why is it so difficult to find scholarships for top schools if you dont make under $100K. Even with a 36 ACT and 4.5 GPA finding it hard to find at favorite top schools. What are my daughter’s chance of a scholarship maybe even full ride?? She got a 33 overall on ACT (34 math and science, 30 english) , 3.97 GPA (out of 4). She is an IB student entering her senior year. A 3.97 is almost a 4.0. Coupled with the AP score of 33, she could easily claim a number of the scholarships listed above. Is there any scholarships for foreign student who are planning to take the SAT? Are these scholarships available for international students, or are the exclusive to US citizens? With a 2.4 GPA, it’s going to be more difficult to qualify for scholarships. You’d want to look at scholarships based on things besides GPA. There are scholarships that are based on essays, artwork, etc that you can try for. Really great and helpful article! Wish all schools were like this!!! Thank you for your comment and kind words! And yes, we wish all schools were like this too, but hopefully more and more will offer merit-based scholarships to attract hard working students and give more opportunity for students to have their college paid for in part or completely. Do you know of any other great scholarship opportunities we should/could share? We like spreading the news about these! Happy Holidays and Happy New Year coming up! order to achieve a scholarship? It will be difficult to get merit based scholarships with a 1200 in all 3 sections. Since the new SAT has not been administered yet there is no baseline score to use. It is safe to assume though that the scores will be similar as the old SAT. I hope this help! The best way to make sure is to call the schools you are interested in directly.